Johannes Van Der Klaauw, the newly-appointed UN Humanitarian Coordinator in Yemen, told a news conference in Geneva that the international community needs to come forward with substantial funding to implement the 2014 response plan for Yemen, which remains alarmingly under-funded. Only 18 per cent of the $592 million needed for 2014 has so far been secured. 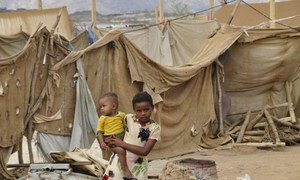 “The continuing humanitarian needs in Yemen are no longer as high on the agenda of the international community as they should be, in our view,” said Mr. Van Der Klaauw, who is also the Representative of the UN High Commissioner for Refugees (UNHCR) in Yemen, noting that global attention is on other crises such as Syria, Central African Republic and South Sudan. “We have a population of more than 25 million Yemenis, of which 14.7 million today is in need of any sort of humanitarian assistance. This is more than half of the population,” he said. Of these, 7.6 million people have been identified as the most needy and for whom the international community developed the $592 million. Of those in need, 10.5 Yemenis are food insecure, 13 million have no access to clean water or adequate sanitation, and 8.6 million have no access to health care, including reproductive health services. In addition, over one million children under the age of five are acutely malnourished. The UN official stressed the need to address the underlying factors of the crisis. “The real problem in Yemen is not one of a humanitarian nature… but of a developmental nature,” he said, citing factors such as structural underdevelopment, a chronic lack of services, weak governance and the rule of law, all of which leaves the country in a very “fragile” state. “The Government should take ownership of working on these needs… to address the drivers of vulnerability, the underlying factors of this crisis,” he added. Yemen has been undergoing a political transition, with a Government of National Unity, which came to power in an election in February 2012 following protests that led to the resignation of former President Ali Abdullah Saleh. Mr. Van Der Klaauw emphasized that the country’s humanitarian issues must be mainstreamed into other political and security processes. While Yemen has made good progress in its political transition, the country will not enjoy stability unless the humanitarian needs of its people are met, a senior United Nations relief official warned today.